We usually have an assigned project per unit or chapter. Projects are worth 40% of your grade. Although we don't have as many projects as we do homework assignments, projects are worth almost double your homework grades. Take these assignments seriously! These projects below are dated from most recent at the top to oldest at the bottom. America has often been referred to as a "melting pot". Many people have left their homeland and immigrated to America in search of a better life. Between 1820 and 1924 over thirty-five million people came to America. For many of them the trip to America was a difficult and often very dangerous trip. When the immigrants arrived most of them had to go through Ellis Island, the immigration headquarters. At Ellis Island, immigrants were inspected and had to pass many tests before they were allowed to enter America. By completing this project you will learn about many of the difficulties and hardships immigrants had to overcome before being allowed to enter America. Ellis island opened in 1892 as a federal immigration station, a purpose it served for more than 60 years (it closed in 1954). 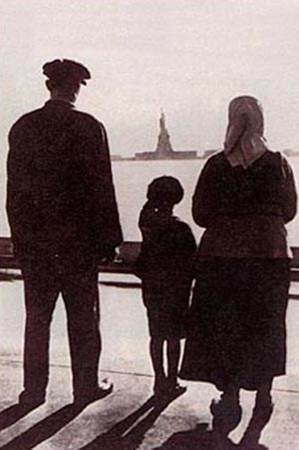 Millions of newly arrived immigrants passed through the station during that time--in fact, it has been estimated that close to 40% of all current U.S. citizens can trace at least one of their ancestors to Ellis Island. 7. Emma Lazarus's Immigration Poem: "The New Colossus Poem"